My Daddy was a hunter. Every year, on opening weekend of bow season, you could find him in a tree, in his camo at sunrise. As the years went by, he traded his gun for a camera and instead taught his kids and grandkids how to enjoy the hobby he loved. 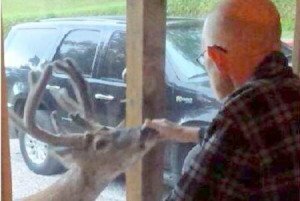 Last week, two days before he died, Daddy met his buck. It was gorgeous, a 10 point with six spikes on one side and four on the other. He came to the window where daddy was sitting in his favorite chair and looked in, right at him. A few minutes later he was on the porch, literally nudging the handle to try and get in. relaxed under his hand and let my Daddy pet him. A wild animal who, for just a few minutes, was as tame as a dog raised from a puppy. My daddy looked at him, and he looked at Daddy and Daddy simply said “I’m ready.” After eight years of fighting a disease that wouldn’t leave him alone, he was ready. After watching 3 kids and 9 grandkids come into this world, he was ready. After coming face to face with an animal he had waited on, for years, he was ready. He had come, one more time, to take Daddy home. It’s hard to describe what it feels like to witness a miracle. But seeing my Daddy, free from fear, in the days where we said goodbye is something I’ll always be grateful for. This is cool. It is me. Such a beautiful, beautiful story. You were privileged to witness such a miracle. I know it brought you peace knowing your dad was not fearful and was ready to go home. Such a beautiful good bye for Daddy! A fine farewell, a true miracle! It inspired me so much. God still works miracles in our lives. Thank you for sharing one. Thank you for this beautiful story of your Daddy’s “homecoming”.